Here comes the cowboy hero who took 1950 by storm -- thundering across the West of your own wild imagination! Dressed in his famous black suit and riding his trusty horse Topper, it's Hopalong Cassidy in sixteen original radio adventures! 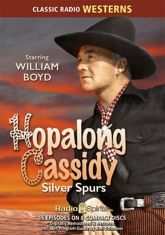 William Boyd stars as Hoppy, with Joseph Duval as California Carlson. Though most of their adventures are in the general vicinity of the Bar 20 ranch, our heroes do venture out on occasion for exploits in the wider world. Listen in as they encounter scoundrels and schemes from the frontier to the formidable streets of New York!